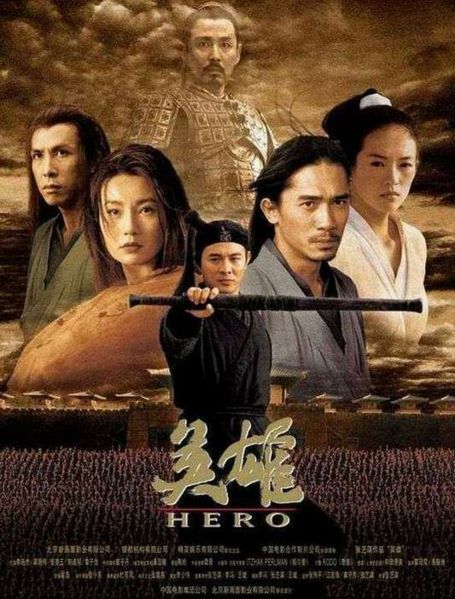 The events in the 2002 film Hero, which was directed by Zhang Yimou, are surely lacking sense in Western paradigms of thought. After all, one story contradicts another, fight scenes do not occur in reality but only in the minds of the fighters, and on top of it all, the film abandons its own genre toward the end when the assassin refuses to do his job. But I feel that the assassin’s refusal to execute the tyrannical emperor resembles Hamlet’s slowness to kill his father’s murderer — both seemingly passive actions are results of higher thinking. 1. Hero and the Tao. The protagonist, obviously for lack of a name, is called “Nameless”. In Arthur Waley’s translation of Lao-Tzu’s Tao Te Ching or Book of the Way from The Way and Its Power, the eternal Tao “cannot be told” — it is nameless. We are enticed to make a Taoist reading of the final action of Nameless — abandoning the mission essentially constitutes non-action . Action-less activity is one of the central teachings of the book. A Western equivalent, but a poor one, is Hamlet, whose consciousness causes him to “lose the name of action” — like Nameless, Hamlet can be said to have renounced his cause through his delays. Perhaps the Tao is what Nameless, Broken Sword and Emperor Qin simultaneously understand, and which the Western audience may possibly miss because it is too difficult to comprehend. Taoism is a kind of active disinterestedness with the ways of the world. Central to this doctrine (though it cautions you to forget this very doctrine) is the notion of emptying ourselves of passion, knowledge and morality. Closest to the Tao is the infant and the water. The infant doesn’t know what’s good or bad. The water doesn’t care where it goes, that’s why it’s everywhere. We can interpret the ending (when Nameless refuses to kill the Emperor) as constitutive of Taoist submission — but this is an active rather than a passive submission, since through it we align ourselves with the “power” and the “mystery” which gave birth to the world. 2. Hero and Confucianism. The setting, which is shortly before the construction of the Great Wall of China by Emperor Qin, is a period in Chinese history when the philosophies of the people were bent on establishing the bureaucracy (government routines and ranks) and the education of officials. This was made possible by the Qin kingdom’s efforts to unite all of China under one rule. Confucianism addresses this need, since its primary concern is the moral virtues of the citizens for harmonious politics. Historically, most of the officials of this era were predominantly influenced by the teachings of Confucius in executing their government functions. The uniformity of the Qin army and the court officials constitutes the Confucian element of the film, and the command to execute Nameless is very much in line with Confucianism, which in turn resembles Platonism in the West. Recall the determination of Socrates to drink the hemlock. The design of the epic revolves around how we gain knowledge about death, choice, and a sense of good and evil. What ensues is an argument that concepts cannot be construed with a positive term — they must always rely on other concepts, often their opposite. God commanded Adam and Eve not to eat the forbidden fruit because the consequence is death. But how can they make sense of death if it has not yet been introduced in the world? We are thus in a situation where nothing can be known without experiencing it first. The Fall gives us knowledge. To know they are capable of choice, the angels must choose the other term (disobedience), because to remain obedient cannot possibly give rise to that knowledge. In the same way, Hero is about how we can only start to make sense of things if, and only if, we gain a knowledge of their opposites. The kingdom of Qin is like God’s heaven in Paradise Lost, the assassins are the rebel angels. Though the rebellion was not successful, and though all the rebels’ actions made no difference in terms of real results, their very existence as an antithesis to the kingdom of Qin made the latter meaningful. Without the antithesis, Emperor Qin can never assert his vision of “all under heaven”. 4. Hero and semiotics. The film has been compared to Leni Reifenstahl’s “The Triumph of the Will”. Other reviews call it propaganda, a call for radical reunification of modern China. This is only a natural result of the politicizing of the text in semiotics. But I believe a Taoist reading of the film (see #1) will dispel the misinformed criticism that the film is a paean to authoritarianism and tyranny. The renunciation of Broken Sword and Nameless can only be seen as mere passivity in Western paradigms of thought. 5. Hero and narrativism. While Hero is clearly about an assassination plot, it is also about the nature of narratives, why they are told, and who gets to tell them. The movement of events in the film resembles a kind of dialectics of tales — one story sublates the last one, not to cancel it out or contradict it totally, but to contain it in a higher and more complex level. (There’s also a Scheherazade-esque story-within-a-story-within-a-story, a technique we witness in One Thousand and One Nights). The version of Nameless is pitted against the version of the Emperor, and when the latter seems to have won, Nameless revises his version to defeat the Emperor’s. In this story, hardly any battle ever took place on the plane of reality. Some fights were fictional, some imagined, the others probably exaggerated. In this film, the real battle is the battle between narratives. I can almost hear Nameless say, “Fiction and swordplay have the same principle”.